You may remember Maddie from the previous blog we wrote about her. 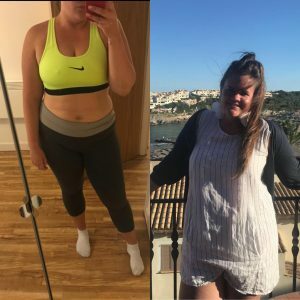 That was September 2018 and Maddie had lost a stone and a half. But Maddie didn’t stop there. 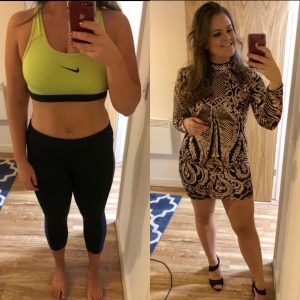 Another Do It In 12 later and a Race For Fitness competition, combined with balancing her food and social life; sees Maddie 2 stone and 10 pounds lighter! This journey is absolutely worthy of a Transformation Thursday shout out! We last wrote a blog about you after Do It In 12 – So what’s new? M – I have since dropped another dress size and am now consistently buying size 12 (even in jeans!!) Another thing I’ve noticed is that my productivity levels are through the roof and for the first time ever I am about to complete dry January (hopefully I haven’t jinxed this now..). To be honest I don’t feel like I am ‘dieting’ anyway. Just eating well and tracking is keeping me focused. M – With the nutrition and training advice I am still losing – in far, I haven’t gained in any weeks at Motive8 in the last 7 months. I occasionally maintain, but there’s always a reason behind it (celebrations etc.). My daily check-ins with Kate really help to keep me on track and not fall off the wagon. If I think back to how I used to treat food and almost be scared of it and yo-yo dieting, the education I have on food now has made it so much easier to make better choices but also not be afraid to have the treat when its needed! It gets easier each day..
One of the great things about training with Motive8 is that I’ve learnt to not focus solely on the scales but also look at body fat % and muscle mass. My next goal is to lose another 5% body fat but to be honest I won’t stop there – it’s mainly about how I feel and look than what the measurements say. Although I feel amazing now compared to how I used to, I still have work to do! I always want to be able to deadlift my body weight (this is going to get easier as I continue to lose weight right!?) and run my first half marathon. I couldn’t even run 5k when I started my first Do It In 12! What advice would you give someone thinking of doing Do It In 12? 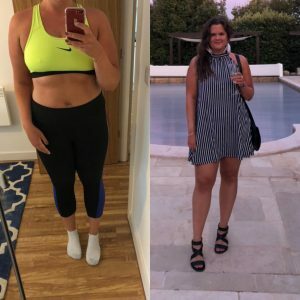 The support you get from the trainer is second to none, but it’s not easy at first – I had to change my lifestyle significantly but I instantly realised the huge benefits that came with this. My first advice if I’m totally honest would be not to start until your heart is 100% in it, but as soon as you get to this point GO FOR IT! It’s not only your health, but also your mental health and how great you start to feel in yourself. Stop saying I’ll start tomorrow and start today – what’s the worst that can happen? If you’ve been inspired by Maddie and would like to Do It In 12, contact the team at [email protected] or call 0113 243 0161.